Waterford Cut Crystal (two Piece) Decanter with Stopper, Pattern WAT66, Marked with as Sea Horse. 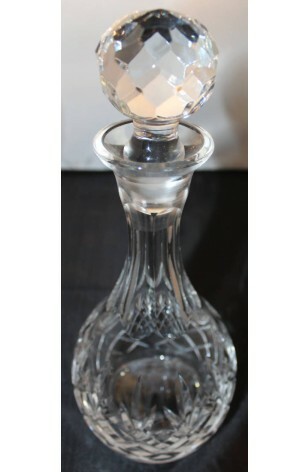 This Beautiful Waterford Cut Crystal Decanter, and Stopper is in the Waterford Pattern WAT66. Fantastic Cuts in Criss-Cross near the Base, along with Fan Cuts, Vertical Cuts, Smooth Stem, and Topped off with a gorgeous and heavy, Diamond Cut Stopper. Has the Waterford Sea Horse Logo Mark. In excellent condition. This Beautiful Waterford Cut Crystal Decanter, and Stopper is in the Waterford Pattern WAT66. Fantastic Cuts in Criss-Cross near the Base, along with Fan Cuts, Vertical Cuts, Smooth Stem, and Topped off with a gorgeous and heavy, Diamond Cut Stopper. Has the Waterford Sea Horse Logo Mark. In Very Good Resale Condition unless otherwise noted below or in pictures.